The country club house The Whispering Pines was closed for the winter, but only one day after he locked the place personally, the narrator sees smoke come out of the chimney. He decides to investigate and enters the house. Hidden in the dark, he sees the sister of his fiance, the girl he secretly loves, run out of the house with tears in her eyes. Upstairs then, he discovers the dead body of his betrothed. Anna Katharine Green is a fantastic writer and this book is very well written. It's a bit too wordy but the mystery is very good. This is probably Anna Katharine Green's most well-known work and upon reading it, it's easy to see why. It's the most complex of her works that I've read so far and involves a dysfunctional family which always makes for a great crime read. There is a small introduction which indicates that while Green was enormously popular years earlier, her strength as an author was beginning to wane. Had I not read this, it would not have occurred to me while reading this. It's true, there were sections that seemed a bit repetitive. 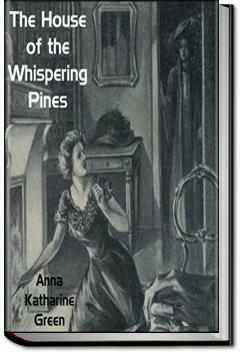 The House of the Whispering Pines was originally published in 1910, which makes it a vintage mystery that should not be compared to today's novels. Anna Katharine Green is a product of her time, flowery language, 19th century values and sentiments bleed across the page.